World Karate President Antonio Espinos says his sport is determined to make the most of its Olympic debut. The sport is one of five selected by Tokyo 2020 in addition to the 28 core sports on the program. The martial art was born on the Japanese island of Okinawa more than a century ago before spreading worldwide. But before the 2020 Olympics, the 2018 Youth Olympic Games in Buenos Aires this October will provide the first taste of the Olympics for karate. A total of 48 athletes, split equally by gender, will head to Argentina for the YOG. 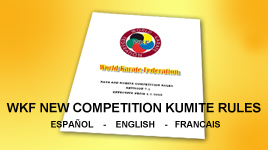 World Karate President Antonio Espinos has led the federation since 1998. He began practicing the sport in his youth, moving on to the leadership of the Spanish federation and the European Karate Federation. Around the Rings Editor Ed Hula spoke to Espinos in Lausanne last month about karate and the Olympics, preparing for the Youth Olympic Games and his hopes for keeping karate on the Olympic program for Paris 2024.